The Beautiful Casa Del Lago is a modern and trendy semi-detached villa with breathtaking lake views in the Marbella & Puerto Banus Hills located on the Zahara de Istán resort. Please check our weekly rates for bed linnen, bath towels and cleaning service as well as for high chair or baby cot. The single beds could be set up as double beds. Smart LED TV 48-inch, with more than 1000 international channels in English, French, Dutch, German and many others. We stayed at the Villa for the month of Feb. 2019. The property is very well situated in the hills between Puerto Banus and Istan and is a great base from which to explore Andalucia. It's a very peaceful setting with spectacular views of the Lake and gorgeous sunsets. The Villa is quiet. Beach; restaurants; shopping and groceries are within 15 minutes drive down to the Sea. The Villa itself is accurately represented in the description and photos in the website. It is clean and comfortable. The kitchen is well stocked with everything necessary for anyone who likes to cook. Most importantly, William the owner is extremely responsive, trustworthy and very easy to work with. He can easily be reached using WhatsApp. Paul, the local representative, is close by and extremely helpful, either regarding the Villa or for information on the area and touring about. All in all, a great experience! Thank you Wim. Det är ett väldigt fint ställe om man vill komma ifrån alla människor och smeten. Vi spelade tennis på Manolo Santana klubb varannan dag som låg 10 minuter därifrån. Vandrade i bergen vid Istan som va magiskt! Lovely home with great amenities. Thoroughly enjoyed our stay. Just a couple of notes: 2nd bathroom downstairs - drains smelled badly of sewage most of the time - very unpleasant. The garden flowers were very overgrown and attracted a tremendous amount of bees during the early mornings. We were two couples travelling from our homes in France looking for winter sunshine and we found it! The property is superb and well presented and in a glorious spot in the hills of Istan, but only 10 mins to the beach and all other amenities, superb shops in Marbella Old Town and more restaurants and choice than we could have hoped for. San Pedro de Alcantara is also a lovely town 10 mins to the west of Marbella and Tarifa further along the coast has the best beaches. Istan further up the hill by 7-8 mins is a small town with 3 very good restaurants and genuine Andalucian hospitality. The property offered us comfort as well all the facilities we could need for our evenings spent after long sunny days on the beach with the dog, exploring the surrounds and coast line as well the inland areas, Ronda, Mijas and others. 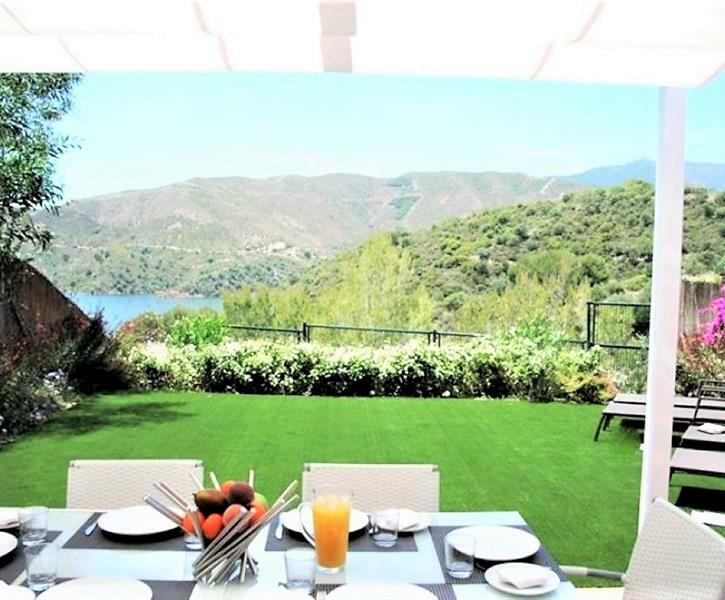 The garden which overlooks the Lake of Istan, like the house on its 2 levels offered fantastic views onto the protected Parque National Sierra de las Nieves. Paul and Jan Knight looked after us very well and were there instantly with answers to any questions we had. Casa del Lago was a wonderful place for our 7 week winter stay! Highly recommended! Thank you.